The air was thick with equal parts anticipation and humidity as more than 500 guests gathered to hear Pennsylvania's 47th governor, Tom Wolf, deliver his six-point plan for agriculture in the commonwealth. "My vision for the future of agriculture takes advantage of what's special about Pennsylvania's farms and food processors to set us apart on a global stage," said Governor Wolf. "We see tremendous opportunities for Pennsylvania, including the opportunity to diversify our business and capitalize on marketing opportunities. And even though there is no shortage of challenges, I believe we are uniquely positioned to capitalize on our many existing strengths and chart a path toward a dynamic and prosperous farming economy in Pennsylvania." 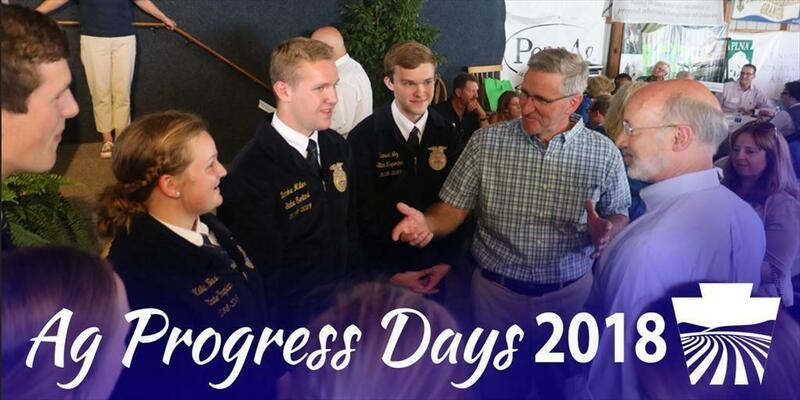 It was a message filled with hope to attendees at the Penn State University College of Agricultural Sciences' Ag Progress Days. Indeed, there was no shortage of optimism throughout the three-day event, as attendees marveled atthe progress the industry has made, while discussing strategic plans for a future filled with opportunities. At the dairy industry breakfast earlier on Wednesday, Secretary of Agriculture Russell Redding unveiled the Wolf Administration's Dairy Development Plan, a document designed to guide Pennsylvania's dairy industry toward growth and development amid a challenging market. "Pennsylvania's dairy industry is a treasure to our commonwealth. It's an industry that's grappling with difficult global market conditions, but one that is also resilient and dominated by hardworking individuals who are entrepreneurial and eager to do what it takes for this industry to grow here," said Sec. Redding. "Pennsylvania's Dairy Development Plan is our attempt to lay out a plan for the future. It lays out both short-term and long-term goals, and recommendations that stakeholders can use as a starting place to strengthen and expand their operations." While the 2018 Pennsylvania Farm Show theme was "Strength in our Diversity," that same diversity was on full display at Ag Progress Days. Plain sect farmers conversed with researchers and scientists; multigenerational farm families mingled with FFA and 4-H students; blacksmiths forged their wares using traditional techniques next to modern technological marvels, combines and other harvesters so large they dwarfed the RVs and food trucks beside them. Interactive exhibits educated guests on creatures that need protected (pollinators like the Monarch butterfly) and those that need eradicated (pests like the Spotted Lanternfly). Pennsylvania's agriculture industry may be diverse, but it is also inclusive. And a big focus of the week was on how we can weave together all of these individual, unique threads into one large, cohesive tapestry. A roundtable discussion with agriculture's future leaders – FFA and 4-H students – explored ways we can both tell and build on our story, how we can redefine what "agriculture" means to Pennsylvanians, and how we can plant seeds of interest in a new generation of agriculturists. Also during the week, industry leaders on Team Pennsylvania's Ag Advisory Board strategized how the public and private sectors can work together to capitalize on the countless opportunities that exist in the marketplace. Our industry is as large as it is strong, an economic powerhouse for the commonwealth. It's built on the continued passion and efforts of countless individuals, each with their own journey, each with their own story. Whether they grow corn and wheat in Lancaster County, operate a community garden in Pittsburgh, or tend a ranch in Tioga, there is a seat at the table for each and every one of us. That was clearly evident this week at Ag Progress Days.